The mythical kingdom of Hyperborea was once dominated by an ancient civilization, which used magic crystals as a source of energy. Over time, the Hyperboreans, drunk with power, eventually exhausted the basements and made the crystals unstable, causing earthquakes, mutations, droughts and floods. But, blinded by their obstinacy, the Hyperboreans dug even deeper. Only a handful of cautious magicians, anticipating the inevitable, erected an indestructible magic barrier. When uncontrollable magical forces were liberated from the depths, hyperborean civilization was destroyed in a single day. Only the presence of the ma- gic barrier prevented the total eradication of life in the surrounding area. Some survivors, who lived in small colonies around Hyperborea, found themselves isolated behind this rampart. The science of crystals was therefore prohibited because it was considered too dangerous, or simply forgotten. In the centuries that followed, six rival nations were founded on the ashes of hyperborean civilization: the Duchy of Carmine and its terrible army, the Emerald Kingdom and its elite archers, the Purple Matriarchate and its fans, worshippers of the Goddess of Life, the Golden Barony, with its merchants and skilled diplomats, the Coral Throne and its organized and efficient society, and the Celestial Kingdom, a recluse and enigmatic nation. The precarious peace maintained between these different peoples did not last. The day came when the magic barrier broke down. The virgin territories enamelled with ruins and cities to be explored, still haunted by the weakened but threatening spectra of the ancient Hyperboreans, have once again become accessible to the six kingdoms. Today, each nation is sending its best warriors and explorers to Hyperborea to establish its supremacy over its rivals. But which way will prevail? The one of brute force or the mastery of science? The discovery of precious artifacts in forgotten ruins or the taking of cities abandoned for centuries? 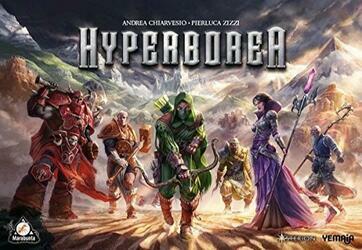 At the head of your faction, only you can lead your people to supremacy over the world of Hyperborea! A game of civilization that can be played in less than 2 hours. A new mechanism of action cubes (the "bag building"). Contents of the box : 6 central hexagonal tiles, 30 central hexagonal tiles, 30 outer region hexagonal tiles, 6 homeland tiles, 6 individual trays, 36 development markers, 6 canvas bags, 180 wooden civilization cubes, 12 people tiles, 60 people figures, 18 spectrum figures, 48 fortress tokens, 64 advanced technology cards, 72 ruins tokens, 72 gems representing victory points, 6 objective tiles, 1 score block, the game rules.